If you can read French then this article and information won’t really help you out much. 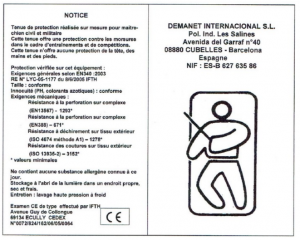 If you’ve taken a look at your bite suit care instructions tag you’ve probably noticed that it is printed in French. Well we translated it for you and here it is in plain English, without the certification standards that the suit meets that you can google if you feel so inclined. “Protective clothing made for civil and military dog ​​handler. This outfit offers protection against bites in training and competitions. This outfit does not offer protection to the head, hands and feet. Improper care of your bite suit will shorten the lifespan of your bite suit. After training it is best to hang your suit to dry. This will allow the bite suit to dry faster than simply placing it back into your bite suit bag. It’s not advised to train in the rain or a water source such as a lake, the ocean or river. However, if you do make sure you thoroughly dry the bite suit before your next use. If the suit does not dry completely you run the risk of developing mold within the suit which will ruin your suit, and if dogs bite a moldy suit they can get sick. If you have any questions about the care of your Demanet bite suit please don’t hesitate to reach out to us!